Living a Fit and Full Life: NCircle Entertainment Encourages Learning with ABCMonsters: Starring QRSTU! + Giveaway! NCircle Entertainment Encourages Learning with ABCMonsters: Starring QRSTU! + Giveaway! Make learning fun with the twenty six cuddly ABC Monsters that live within the walls of Capital Castle! In ABCMonsters volume 5 kids will learn all about letters Q, R, S, T, and U in a super fun and entertaining educational DVD. As a homeschooling mom I love educational DVDs because I've found them to be extremely helpful in our homeschooling journey. Learning letters can be tough and quite boring but I've found that when my kids can watch DVDs that teach them they seem to pick them up pretty quickly. 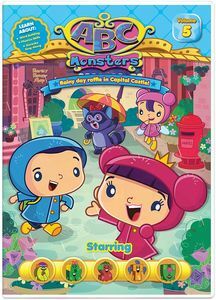 I've used a few other DVDs that taught letters and I have to say ABCMonsters has to be the most entertaining. Even I was pulled into the entertainment and found myself watching and enjoying the DVD. My kids loved the ABCMonsters DVDs and even my 9 year old seemed to enjoy it. My 4 year old has just about learned all her letters but was struggling with a few and thanks to these ABCMonsters DVDs she now knows them all. Each volume was just as entertaining as the last and my kiddos can't wait to watch volume 6 when it's released. ABCMonsters: Starring QRSTU is the perfect way for kids to learn all about Q, R, S, T, and U! If you don't have the previous volumes I highly suggest you pick them up! Click HERE to learn more about ABCMonsters!